While the sabermetric revolution has given us much better tools to evaluate fielding ability, there are still questions about how accurate these methods are. In fact, the two most popular forms of WAR still use fairly different metrics to asses fielding. So perhaps the best way to judge fielding prowess is combination of sabermetrics and the old eye test. Using bWAR, which assesses fielding with an intricate +/- system, we’ve listed the top ten defensive players so far of 2014. The chances are that one of them is the best defensive player in baseball. With the help of videos, it’s up to your eyes to tell us which one. bWar rates Martin the 10th best fielder in baseball and the Rangers CF’s defense has been one of the few bright spots in otherwise dismal season for Texas. The 26-year old Cuban import has also posted his best offensive numbers this year, and is quietly becoming one of the most valuable players in the American League. It’s been a tough season overall for the Red Sox’s second baseman, who was shutdown for the season yesterday with wrist troubles. But the mighty mite never let his struggles at the plate bleed into his defense, which has been excellent throughout his career. LeMaieu played all over the infield in the minors, but has settled in at second base as a big leaguer. With Nolan Arenado and Troy Tulowitzki to his right, it’s safe to say the Rockies have the best fielding infield in the National League, if not all of baseball. There must be something in the water in St. Louis. Peralta is the latest in a long line of players who improve when the come to the Cardinals. The 32-year, a stealth MVP candidate if St. Louis makes the playoffs, is having the best year of his career in large part to his excellent defense. The most obscure name on this list, the 23-year old rookie has been revelation patrolling the middle of the spacious outfield at Chase Field. He’s probably going to need to hit a bit more to keep his spot in Arizona’s crowded outfield, but his glove has certainly been up to the task. The A’s recent implosion has taken some of the shine off of Donaldson’s great season. But he still leads all position players in WAR, and his leather at the hot corner is a big part of that. It seems like every year Reds shortstop Zack Cozart gets better with the glove and worse with the bat. So while he might be baseball’s fourth best fielder by bWar, he’s become a real black hole in the lineup. If this list was strictly based on runs saves, Heyward would be at the top. However, bWAR rightly adjusts for position, and right is the third least challenging spot to field on the diamond. Last year Simmons may have had the best defensive season in MLB history. He hasn’t quite been that sharp this year, but the rocket-armed 25-year old is still a wizard at short. If you are wondering how the Mets are flirting with .500 despite a mediocre, injury-ridden roster and disappointing seasons from Curtis Granderson and David Wright, look no further than the amazing play they are getting from Juan Legares in center. The 25-year old, our pick for the best defensive player in baseball, validates the bWar system by also being their pick. 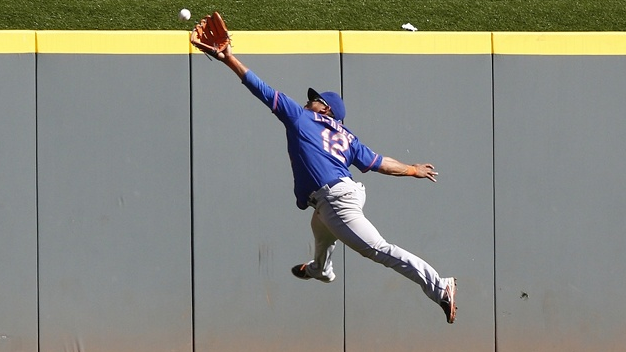 Who do you think the best fielder in MLB is?